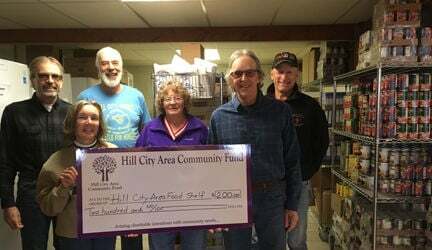 From left, Bill Flynn and Bonnie Harcey, organizers of the Hill City Area Food Shelf, accept a grant from Ron Parker, Sue Kaslow, Mike Lentz and Dan Kingsley, Hill City Area Community Fund Advisory Committee members. The Hill City Area Food Shelf is located at Trinity Lutheran Church, 113 Ione Avenue in Hill City. From left, Mike Lentz and Bill Flynn, members of the Hill City Area Community Fund Advisory Committee show some of the items available at the Food Shelf. From left, Mike Lentz and Bill Klennert, Hill City Area Community Fund Advisory Committee members help unload and prepare for shoppers at the Hill City Area Food Shelf. The Hill City Area Community Fund recently provided a grant to the local food shelf. 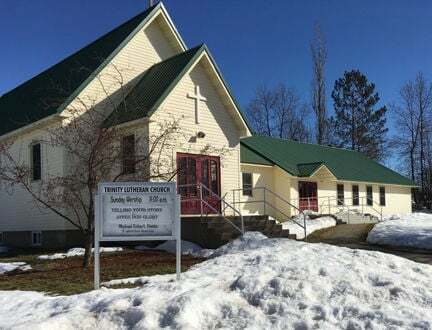 Serving 69 families, the Hill City Area Food Shelf is located in Trinity Lutheran Church, one block east of Roadside. The Food Shelf is open from 8:30 a.m. - noon, on the third Saturday of each month. The Hill City Area Community Fund has provided numerous grants over the years, all for the betterment and benefit of the Hill City Area. Last year, the Community Fund provided a grant to the City of Palisade for school supplies for local children. Grants have been provided to the Jacobson Community Center and other local organizations, all supporting the health and welfare of the people in the Hill City Area. Jacobson, Swartara, Palisade, Hill City, and Spang Township each have an individual identity. Now, by working together with the same energy that has created those distinctive identities, they are creating a lasting legacy to continue the work of community building. The Hill City Area Community Fund, with matching dollars from the Grand Rapids Area Community Foundation’s campaign, COMMUNITY GIVING TO COMMUNITY, provides this opportunity. “We’ve done this before - linking our communities with snowmobile trails, sharing talents and knowledge in community education programs, and building our volunteer fire departments. Our individual communities are stronger when we work together and will be even better places to live,” notes Mike Lentz, member of the Hill City Area Community Fund Advisory Committee. Investment in the Hill City Area Community Fund is an investment in the future. A gift to this unrestricted endowment is a gift to future generations. No one can anticipate the future needs of the community. What will our children require when they become business and civic leaders? What will our grandchildren need? By contributing to a fund with strong leadership, broadly defined community goals and sound financial management, donors have confidence that the future of the community will be well served. The goal of the COMMUNITY GIVING TO COMMUNITY campaign is to raise $200,000 in unrestricted endowment funds. To help achieve that goal, the Grand Rapids Area Community Foundation will double each dollar with a matching grant from the Blandin Foundation. The Hill City Area Community Fund has the flexibility to react to community needs, and allows projects to receive tax-deductible donations so that fund raising for approved projects can move forward quickly. It also permits donors to give to the community, knowing their legacy will work toward the betterment of the Hill City Area for decades to come. If you or someone you know could use some help with food in the Hill City Area, we have local resources available. From the Food Shelf at Trinity Lutheran, Meals on Wheels, Rural Delivery and Senior Dining at the Hill Lake Café, please reach out to your neighbors, speak to someone at the Hill City Food Shelf, or contact Public Health at (218) 927 -7200 or (800) 328 -3744. The Grand Rapids Area Community Foundation has been connecting donor’s charitable intentions to community needs for over 25 years to make our Greater Itasca Area – and the world - a better place to live. We invite you to become part of the great work we do and to include us in your conversation with your financial or estate planner to answer the question “what good do you want your money to do?” For more information, visit our website at www.gracf.org or schedule a visit by calling (218) 999-9100.